Pelage: Narrowly spaced black and white stripes. Locomotion: trot, gallop, and walk. Activity Cycle: Active day and night; spend about 50% of time grazing; prefer to drink in the morning. Social Groups: No herd system; female with young create sole lasting bonds. Diet: Eat grasses, typically those low in protein. Consume more browse in times of drought. Predators: Mainly targeted by lions; also leopards, spotted hyaenas, hunting dogs, and cheetah. Sexual Maturity: Males mature about 6 years of age while females begin to reproduce at 3-4 years. Gestation: 390 days; the longest period of any horse species. Subtle variations in a zebra's stripes allow each individual to be recognized. 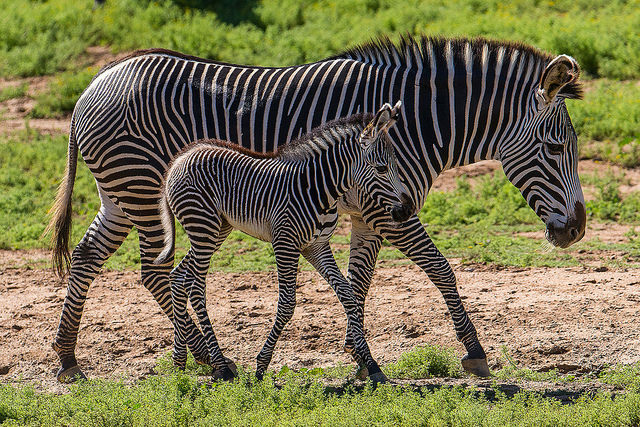 A San Diego Zoo conservation project, begun in 2004, helps support Kenyan Samburu pastoralist families who have set aside and protect 128,500 acres of prime Grevy's habitat in their homeland. © 2010-2019 San Diego Zoo Global. Minor update May 2015. IUCN red list update 2016. How to cite: Grevy's Zebra (Equus grevyi) Fact Sheet. c2010-2015. San Diego (CA): San Diego Zoo Global; [accessed YYYY Mmm dd]. http://ielc.libguides.com/sdzg/factsheets/ grevyszebra.